Save A Dog is a humane society whose primary focus is rescuing and rehoming abandoned dogs. We began in 1999 as an all-breed, all-volunteer dog rescue group and ran out of our founder's home for nine years. Finally we have a lovely facility and kennel which we are renting to own in Sudbury, Mass. Save A Dog is a privately funded 501(c)3 organization. Our Tax ID number is 04-3476937. Save A Dog was founded by husband and wife team, Shirley Moore and David Bernier, of Wayland, Mass. After volunteering at local shelters and seeing the detrimental effect that kennel life had on some dogs, they decided to begin fostering and to build a foster network for the dogs they took in from local and remote dog pounds. They targeted many of the big city shelters and would load up their vans with many adoptable dogs, foster them, provide medical care and a holistic protocol, and put them up for adoption to approved homes. Save A Dog has grown over the years and now we have over 100 volunteers who help on an as-needed basis, and approximately 25-30 volunteers who help on a weekly basis. With millions of pets being euthanized annually, our goal is to save as many lives as we can even though we are a relatively small humane society. One way to maximize the number of lives we can save at one time is to bring in groups of a dozen or so dogs at one time. In rural West Virginia and Tennessee, the plight of dogs is heart-breaking. Puppies are thrown in dumpsters, drowned, or left in a box in the woods to die. 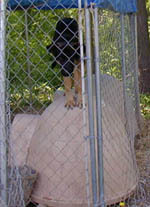 We work with several humane societies in the south who are overwhelmed with dogs. They foster the dogs for us prior to sending them up for adoption. The dogs we receive from rural humane societies all would otherwise have been put to sleep. We also take in local dogs who are in need on a regular basis. One of our primary goals is to educate people in our community about pet overpopulation and the need to "adopt" rather than "buy". In doing so, we provide friendly, good-natured, dogs for adoption. There is no need to go to a breeder when one out of every three dogs who end up in a shelter is purebred. In some cities, 60% of the dogs are purebred, including "designer dogs". Evaluating dogs for temperament and adoptability has been the key factor in our being able to provide such great dogs to the people of Metrowest Boston and the New England area. 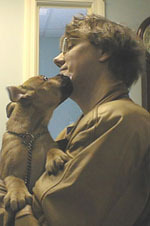 We have the combined skills of previous shelter experience and numerous dog evaluation training classes and workshops. We have provided this training to our volunteers and have sponsored this type of training to local animal control officers and other shelter and rescue workers in our locale. As we have a bit of a shortage of young, adoptable dogs in the North East, we are able to ffer many of the southern dogs a great opportunity to be rescued and adopted into loving homes. These dogs tend to be friendly and generally forgiving of any neglect they may have experienced at the hands of humans. By offering adoptable dogs to people in the New England area, our goal is to save lives while providing a good resource of dogs to people who might have otherwise unknowingly supported a puppy mill by buying a dog from a pet store. Our rescued dogs are up to date on the core vaccines and the adult dogs are spayed or neutered prior to adoption. We do not spay and neuter puppies as it has been proven that puppies need hormones for proper bone development. As well, they have developing immune systems and need to have their puppy vaccines and rabies underway before opening them up to surgery. We use a holistic protocol in caring for our rescued dogs and we have found that we are able to bring the dogs to optimal health without all the conventional pharmaceuticals that most shelters use. Save A Dog provides supplements and a healthy diet to boost the rescued dogs' immune systems. The new arrivals residing at the kennel listen to "animal healing" music during their stay and they also benefit from aromatherapy. Our founder, Shirley Moore, has studied homeopathy for a number of years and provides homeopathic remedies to dogs who have minor medical issues, and with good results. This saves the shelter in extraneous medical costs as does our visiting veterinarian, Dr. Betsy Johnson, who donates many hours of her own time to providing medical care for dogs in need. Save A Dog maintains an ID system on all adopted dogs with a database of adopter information. This makes it easy to reunite the dogs with their adopters should they become lost. We have a solid return policy so that any dog adopted through Save A Dog will not end up in danger of being euthanized again. Every dog we rescue is celebrated and doted on by our dog-loving volunteers. We have a training program for adopters as well as newsletter-follow-ups with advice on training, health, and places to go with your dog. Many of our adopters have returned for a second dog and we have a very strong showing at our alumni events as well. We are a privately funded organization and rely on entirely donations to keep the rescue mission going. We hope to purchase the property that we are renting in the very near future so that we may continue this important work of saving dogs and educating the public about dogs in need. If you would like to help, please go to our Donations page, or email us at saveadog@saveadog.org with your ideas.